Song Saa Private Island is a Song Saa Collective Resort. 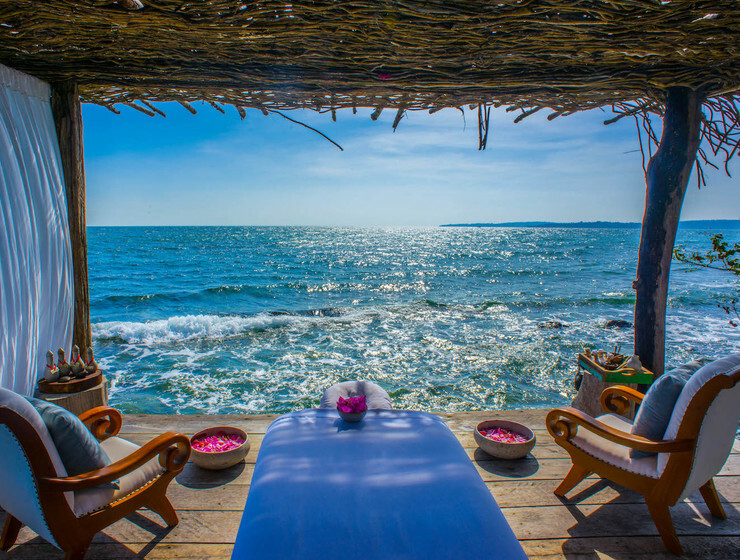 Created with sustainability in mind, the luxury escape is an intimate paradise reflecting the beauty of the Cambodian coastline, the serenity of nature, and infused with the soul of the local community. A tropical getaway with a pristine private beach, spacious wooden villas, heavenly spa sanctuaries and a preserved coral reef, Song Saa Private Island lets you detach from the world and tune into simple luxuries. 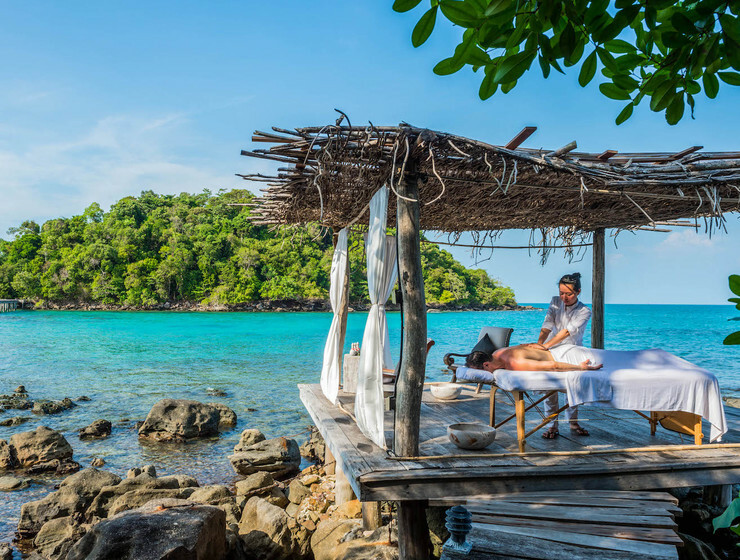 Song Saa Private Island offers an evolved 'spa with no walls concept that integrates the wellness journey with the natural environment of the Song Saa islands with little ‘sanctuaries’ dotted around the resort. The spa philosophy embraces the Buddhist tradition of metta bhavana—the cultivation of loving-kindness. This retreat combines nutrition, exercise and indulgent spa treatments to detoxify the body systems, leaving you full of vitality. Inspired by the ‘blessing’ spa treatments, this empowering retreat allows you to recalibrate, setting you on the right path for long-lasting health and happiness. Song Saa Private Island offers 24 spacious luxury villas, each featuring a private pool and spectacular island and ocean views. Built with reclaimed timber and materials from the mainland, the resort’s design and architecture reiterate their commitment to sustainability. Each villa is a private sanctuary, a refined blend of thatched roofs, linen-draped canopy beds, up-cycled décor and repurposed furniture. Discarded oil drums find new life as lamps. Driftwood serves as a table or bench. Salvaged wood from old fishing boats and factory yards now form decks and floors and beams. The four different kinds of villa - Jungle, Ocean View, Over Water, and Royal - are all kitted out with king-size beds, a fully stocked minibar, and modern amenities like high-speed wifi, iPad and Android docking stations, and flat-screen TVs, as well as little luxuries like day beds, outdoor showers and sunken bathtubs. Song Saa Private Island offers global cuisine with a local touch. Fresh, organic ingredients are sourced from our own gardens, with seafood from local fishing villages and imported goods from trusted international suppliers. The resort features two stunning restaurants: the Vista Bar and Restaurant, with oversized bean bags and a breezy waterfront location that serves up Khmer cuisine and creative renditions of Western classics; and Driftwood, casual bar and dining concept where you can enjoy a post-swim beer, an evening cocktail, or a refreshing glass of chilled Brut with delicious pizza or tapas bites. 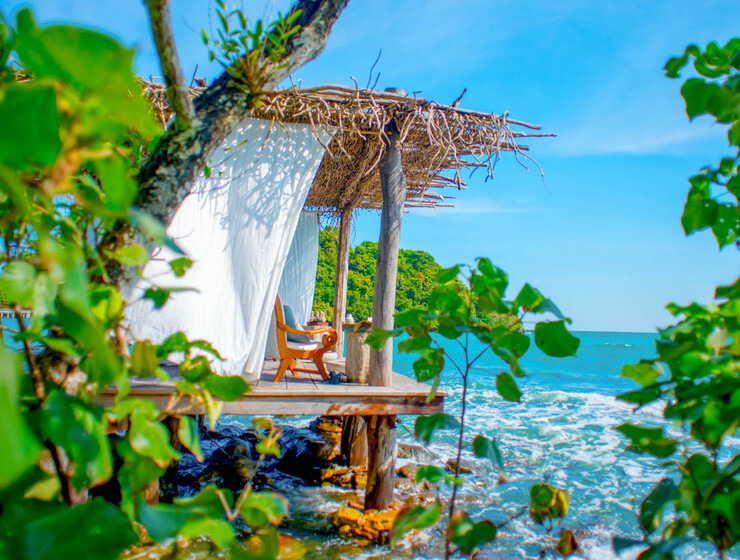 Additionally, if you’d rather find a quiet corner—on the beach, or under the stars—Song Saa will arrange a personalised and private dining experience for you. They also have an extensive vegan and vegetarian menu, and can cater to dietary requirements. Room prices are subject to change depending on dates. Please enquire for a full and accurate quote. Song Saa Private Island spans the ‘sweetheart’ islands of Koh Bong and Koh Ouen in Cambodia’s untouched Koh Rong Archipelago. The islands are accessible via a 45-minute speedboat ride from Sihanoukville.